Bali is one of my favourite cities to visit from Singapore - it is only two hours away on plane and the landscape is beautiful. Depending on what you are after, heading to Seminyak, Nusa Dua, Uluwatu and Ubud (just to name a few) can transform that experience entirely. While I do typically stay in Nusa Dua because of the resorts, I was actually really looking forward to checking out Ubud after hearing so much about it. Getting from Singapore to Bali is easy and if you are sitting on a trove of KrisFlyer Miles, you may consider redeeming a one-way Business Class flight from Singapore to Denpasar on SQ for just 19,000 KrisFlyer Miles - I have taken SQ942 at least five times now and I definitely recommend it since you get to Bali just before noon. 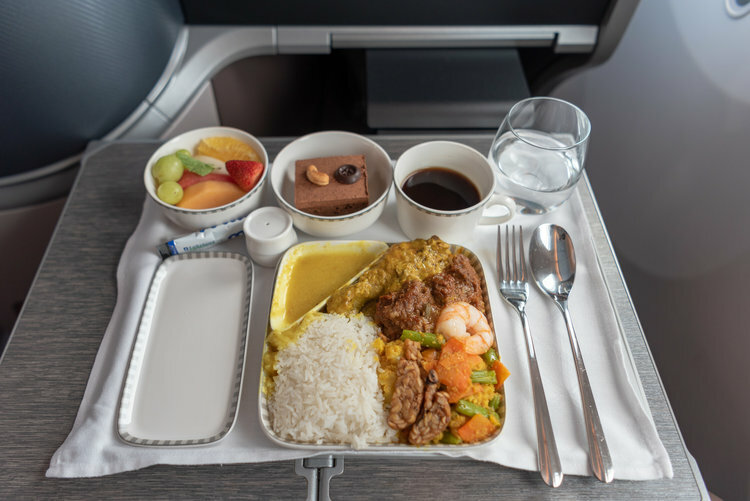 Click HERE to find out how you can fly to Bali in Business Class for 19,000 Miles! Having spent two nights in HOSHINOYA Bali where I felt like I have been on a spiritual journey have been humbling but I was also looking forward to spending the extended weekend over at the famous Alila Ubud. It is certainly worth noting that Two Roads Hospitality (who owns brands like Alila, Joie de Vivre and Thompson) have been acquired by Hyatt last year so my experience here at the Alila Ubud as a DISCOVERY Loyalty Black member may not be applicable to say, a World of Hyatt Globalist member. I got to the Alila Ubud at approximately 1:00PM but was informed that my room was not yet ready as the hotel was running at close to 100% occupancy the night before. Now, the Alila Ubud is home to just 56 rooms and suites so it certainly isn't a large property. As a top-tier DISCOVERY Loyalty Black member, I was greeted by the General Manager of the property and was accorded a double-upgrade into a Pool Villa for the duration of my stay. My original booking was for a Deluxe Room and the double-upgrade was worth more than SGD 800 in terms of my original booking value (it always pays to be an elite member of a loyalty program!). Since my Pool Villa was not yet ready, I was invited by one of the friendly front office staff to enjoy a (complimentary) coffee by the pool. Shortly after, I decided to have lunch at Plantation Restaurant which serves up a good selection of Indonesian and Balinese dishes - I made this dining reservation via Chope so it earned me a good number of Chope-Dollars which I can use for free dining vouchers in select cities. The food at Plantation Restaurant was decently priced and I did get 20% off as a DISCOVERY Loyalty Black member so that helped to somewhat absorb the applicable taxes and charges - lunch should cost approximately SGD 40 per person without alcoholic drinks. I went back to the hotel lobby (located just above the Plantation Restaurant) after lunch and was told that my villa was ready (hurrah!). My luggage and bags were already brought to the villa and I was shown to the Pool Villa which is located towards the back of the property (which meant more privacy!). Compared to the Deluxe Room which is just 65sqm in size, the Pool Villa features 120sqm of space and it comes with a private pool amidst a landscape garden. The one thing that I noticed immediately is how warm the room actually was. Now I have to confess that I love sleeping in the cold and I usually set my air-conditioning at 18 degree Celsius even in very new hotels but the temperature here was hovering at approximately 25 degree Celsius (even on the lowest setting) in the afternoon. You should know that the Alila Ubud first opened back in April 1996 so the property has been operating for more than 20 years so you will certainly notice signs of age throughout. Apparently the property went through some refurbishment back in 2010 (and there are some newer and nicer areas of the hotel like the swimming pool and the restaurant) but the air-conditioning could do with a replacement. Apart from the air-conditioning issue (which will not be an issue if you are looking to embrace the warm tropical weather), the Pool Villa is beautiful and the first thing you will see when you enter your bedroom is the four-poster bed. The super-king bed is really comfortable and the mosquito net certainly did come in handy in the evening (more on this later!). There is also a seating area that spans across the width of the windows and that is a great spot to spend some time in (especially in the evenings) with your favourite book or magazine. I received a beautifully-assembled bowl of fruits as well as some kerupuk (deep-fried flavoured crackers) which was served with fresh sambal. In fact, they were cleared away the next morning because the hotel probably doesn’t want you to snack on a day-old sambal (things like that can go bad overnight). In any case, I am always happy to receive savoury snacks in place of chocolates since I do not really have a sweet tooth. There is a coffee machine in my luxurious Pool Villa and if you prefer to enjoy a cup of tea, complimentary teabags from JING Tea are provided in the room - these are also replenished during evening turndown so do not feel like you need to save on them for the whole duration of your stay. The one thing that stands out most from this Pool Villa (and this is also probably why people would pick this room type over the cheaper ones) is the presence of a private pool. The Alila Ubud has a beautiful swimming pool (which is constantly being ranked as one of the top swimming pools in the world) that all guests can utilise but nothing beats having a private pool when you are in Bali. In fact, no trip to Bali is complete without a proper dip in the pool and having a private one makes that experience so much better. Honestly, I was surprised to see such a large pool in my Pool Villa - I am not exactly sure how big it is but if I had to give my best guess, I would say 15m at least. Since you are surrounded by nature and lush forests, it is not surprising that a couple of visitors may drop by while you are enjoying a dip in the pool. I have spotted at least ten monkeys while I was there (but sadly I only managed to capture one using my camera since I had to run back into the villa to grab it) and they generally do their own thing. It is probably not a great idea to leave any exposed food outside in your balcony since these monkeys do roam around the area. With all that being said, there was a innate sense of calm when I was floating on my back and watching the monkeys go about their usual routine (you may need to explain some of their actions to your children). 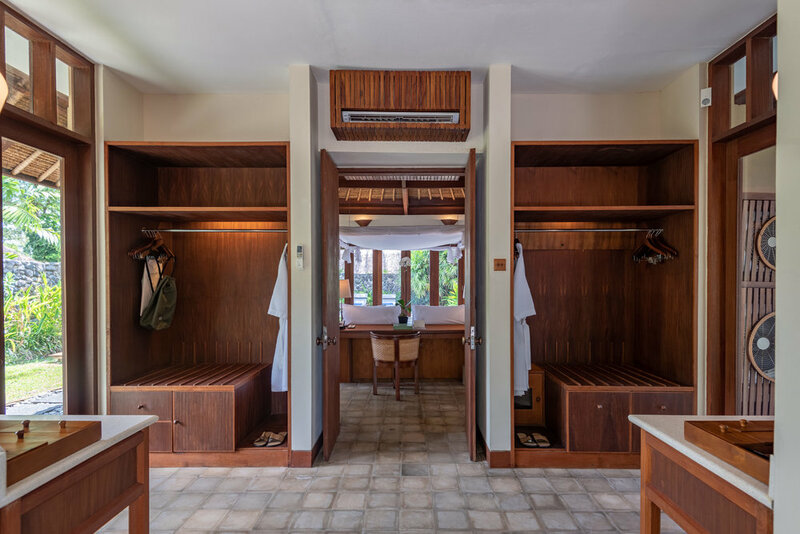 The bathroom of the Pool Villa comes with His & Her amenities as well as separate wardrobe spaces for you to organise your clothes. There is also one sink on each side (so you do not have to jostle for that same one in the morning) and the door facing the garden can also be left open if you prefer to enjoy the tropical weather over air-conditioning. As mentioned earlier, the room does not get too cold even with both air-conditioning units turned on so this is something that I truly hope that the property can change in the near future. Towards the end of the bathroom is where you will find the toilet on one side and the shower area on the other - bath amenities provided by Alila Living (which I love and ended up purchasing more of from the shop at Alila Ubud) and it comes with different scents for men and women. I really like the consistency of the bath gels and they smell amazing in a non-artificial way. 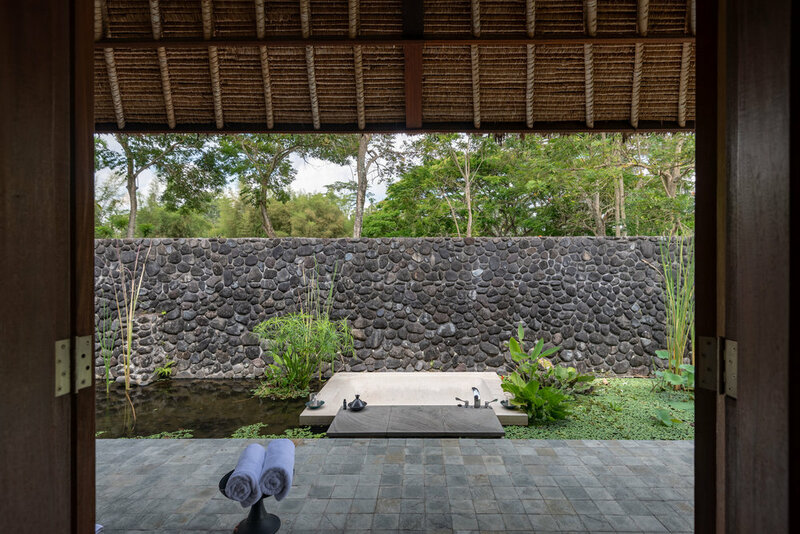 There is another door at the end of the bathroom which opens up to an outdoor area where you will find an open-air bathtub that is set in the middle of a lotus pond. While I have been to villas and suites where the bathtub is located outdoors (e.g. Anantara Mai Khao Phuket Villas), this was the first time that my bathtub was actually located in a lotus pond (with plenty of fishes around!). I love the novelty of it all but half the time I was worried about the bubbles spilling over into the lotus pond (will it poison the fishes?!). Also, the obvious downside to having an outdoor tub is the problem with rain - should you still use the tub when it is raining (will it be enjoyable?!). What I did like about my bath experience here in the Alila Ubud was the bath amenities that the hotel provided - bath salts and bath gel (designed to give you that bubbly experience) were both provided by the side of the tub. Enjoying the tropical weather while soaking in a bathtub in the middle of a lotus pond is really not something that you can get at any other hotel. It goes without saying that these amenities are replenished during evening turndown as well as in the morning so feel free to recreate that perfect bath experience each time you are in it. Complimentary afternoon tea (not the Western kind) is served at the Cabana Lounge next to the pool - opt for complimentary coffee and tea alongside some local snacks. This benefit was not really publicised during my stay (it was not mentioned during my check-in as well) but I read it somewhere so I decided to call to check whether the benefit was still available (and it was!). I also ended up staying a bit longer at the Cabana Lounge after the afternoon tea since it was balmy and nice. There was also a happy hour promotion that was running (I can’t quite remember what the exact price was) and the drinks were quite delicious (albeit it could do with a little more alcohol) - I guess most hotel guests are not looking to get smashed. After having enough drinks and a quick dinner at the Plantation Restaurant, I walked back to the Pool Villa and prepared for bed. Even though the room is cooler in the evening and it is really quite quiet around, there was a mosquito problem on the first night. I lowered the mosquito nets and slapped on some of that mosquito repellent that was provided by the hotel - that seem to have helped a little but nevertheless it wasn’t a great experience. I raised the mosquito issue the next morning and the hotel staff actually arranged for the villa’s surroundings to be fumigated (the second night was better but I took extra precautions so I do not know if the fumigation worked). Breakfast at the Alila Ubud is served at the Plantation Restaurant and it is an elaborate event - there is an a la carte menu to choose from (there isn’t a buffet station at all) and this menu changes from a day-to-day basis (I would imagine that things would begin to repeat after a number of days but the mains were different on both mornings that I was there). I really like the way food was presented as well - the bread basket is one of my personal favourites since everything in there was done beautifully. What I did appreciate the most however were the main courses - not only were the flavours authentic, they were also given a cleaner presentation. I also loved the unlimited fresh juices and solid coffees that you could order off the menu. If you wish to enjoy a quiet breakfast, make sure to come down a little earlier so you can check out the swimming pool when it is empty and take in the sights and sounds of the surroundings. It goes without saying that taking a dip in the swimming pool of the Alila Ubud should be on everyone’s list - the chairs do fill up rather quickly so if you want a good spot, make sure you drop by the pool early. Otherwise, there are other chairs located below the pool that looks out to the valley below (but the experience is just not quite the same). Located further down the pool is a small walkway which leads to a private bale bengong. Since I was not planning on leaving the property at all, I redeemed one of my Local Experiences from my DISCOVERY Loyalty account for the Rainforest Experience. This ridiculously-indulging experience starts off with a relaxing foot bath before a 90-minute massage. You then have a delicious 3-course set lunch before enjoying another 60-minute reflexology massage - what a great way to use your Black Local Experience! I really enjoyed the 3-course set lunch that was served in between my treatments - I had a choice between a Detox or a Pan-Asian menu so no points for guessing which one I went with instead. The dishes were well-executed and enjoying it in the privacy of my own bale made all the difference. The Alila Ubud is my first Alila stay (even though I have been meaning to check out the Alila Seminyak for the longest time) and honestly, I really did enjoy it. Even though the mosquito problem on the first night was not a great way to start the stay, the food on property is excellent and the recent acquisition will only make this place more popular.